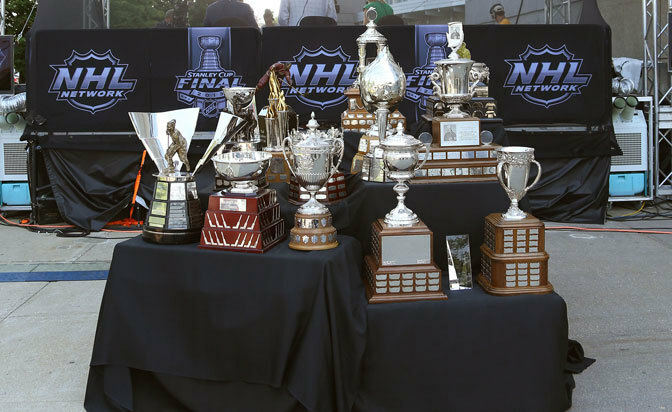 7:20-Susan Sarandon is explaining the history of the Selke Trophy. I am not making this up. The trophy is over 30 years old, so she doesn’t seem to be too interested. 7:22-Michael Peca and the guy from About a Boy are presenting the Selke Trophy. Peca is. Not doing. A. Good. Job. Reading the. Teleprompter. 7:25-Patrice Bergeron ends his Selke acceptance speech in French. Not gonna see that at the Emmys! Snuffleupagus pulls Bergeron back as he’s walking offstage, takes out his camera, and explains that unlike other awards shows, he doesn’t want to take a selfie with Bergeron, but rather a “selke.” First time I laughed all night! Who had the under? 7:31-And now a serious moment. Snuffleupagus interviews Rich Peverly about his frightening experience collapsing during a game earlier this season. Then they get ready to present the Masterton Trophy for perseverance and dedication. If Dominic Moore doesn’t win, I’m boycotting the rest of the show. 7:34-Dominic wins and gives a moving speech about his late wife. TV stays on. 7:36-Luc Robitaille and the black chick from Parks and Rec are presenting the Calder Trophy. She shows off a picture of herself in a Kings’ Stanley Cup Champions hat. Then an awkward selfie/selke with Gary Bettman. I’m crying and drinking at the same time. 7:39-Nathan MacKinnon wins Rook of the Year. I’m pretty sure that every award winner so far has thanked his organ-i-zation. How aboot that? 7:42-Throughout the night, they’re showing highlights of the Hart Trophy nominees. Sidney is first. I expect to see three minutes of him glaring angrily at referees and crumpling to the ice after somebody blows on him. 7:44-We take a look at Doc Emerick calling play-by-play for various bubble hockey games played on the red carpet. It’s pretty awesome. He somehow knows the name of the plastic goaltender’s high school coach. 7:46-P.K. Subban interviews Dom Moore backstage. Subban doesn’t seem to understand the concept of holding the mike in front of your face when you’re talking. Either that or he’s getting revenge for the Rangers eliminating the Habs in the East Finals. Devious. Elvis is talking to someone off-camera. I need to see an awkward shot of Gary Bettman sometime soon. 7:48-Alex Ovechkin is presented the Maurice Richard Trophy for leading the league in scoring. He makes a joke about his coach getting fired. If the NBA had an awards show, Kyrie Irving would be a laugh riot. 7:55-Adam Graves and Cuba Gooding, Jr. are presenting the King Clancy Trophy, NHL Foundation Player Award, and Mark Messier Leadership Award. Mess comes out to present his namesake trophy. Cuba Gooding yells a lot and earns a few bleeps while Adam Graves stoically recites his lines in a thick Canadian accent. They’re the clubhouse leaders for most mismatched presenters so far. 8:05-Doc Emerick and Eddie Olczyk are announcing which player will be on the cover of the NHL 15 video game. They show gameplay that is blocky and static with a caption underneath that reads “ACTUAL GAMEPLAY – WORK IN PROGRESS.” It’s a shame they didn’t show the caption during all the Islanders’ game broadcasts this year. 8:11-Boreanaz alert! He and Chris Pronger present the Norris Trophy to Duncan Keith. After a speech that ranges in excitement somewhere between Ben Stein and Tim Duncan, the music plays him off the stage before he finishes just like Chicago’s playoff run. 8:17-James Lipton pulls a Sarandon and explains the history of the Jack Adams Award, which is won by Patrick Roy. Roy then takes the trophy and smashes it over Snuffleupagus’s head. No, actually he makes a boring speech, making sure to sprinkle in some French. Were you expecting something else? 8:22-Haven’t seen Marty Brodeur yet. He must be at the Wynn’s famous all-you-can-eat buffet. 8:25-Matisyahu is performing a song called Champions dedicated to the Kings. I jump out the window. 8:28-I may have a broken leg but this is a hockey awards show! Play on! 8:32-Whoopi Goldberg gives a brief Sarandon of the Lady Byng Trophy. You think she’s into Lady Byngs? 8:35-Michael Vartan hands out the Lady Byng hardware. Ryan O’Reilly earns the trophy, which looks like something that you would win at an 8th grade spelling bee. O’Reilly shouts out to his girlfriend who gets an immediate camera shot. She’s a hottie. I guess nice guys do finish first. 8:38-Claude Giroux gets his Hart montage. He’s sitting in the crowd with another gorgeous girl. I really should have been a hockey player. 8:42-The General Manager of the Year trophy is next. It interestingly doesn’t have a name. Just General Manager of the Year trophy. Couldn’t we make some regal-sounding Canadian name up? The Duke Winchester Trophy, perhaps? 8:43-Bob Murray of the Anaheim Ducks wins the Duke Winchester Trophy. He jokes about trading his players and making sure his scouts are still working. Hockey people are so funny. 8:46-Colin Hanks comes out and brags about how lucky he is to be a Kings fan before the presentation of the Vezina Trophy. I pull the pin out of a grenade and let it explode. But I’m watching the NHL Awards! Let’s keep going!!! 8:48-Tuukka Rask wins the Vezina. He says it’s the most nervous he’s been in his life. Somehow, I get the feeling that accepting a trophy in front of Cuba Gooding, Jr. and Fake Michael Jackson isn’t as nerve-wracking as the Stanley Cup Finals. 8:50-This is the part of any awards show where you wonder where the host went. Where is Snuffleupagus? Where is Bettman? I’m losing my buzz. 8:53-P.K. interviews Tuukka in the back. He seems to understand how a microphone works now. This is going to do nothing but increase his value as a free agent. 8:58-Time to pull the goalie and bring the big guns out! Michael J. Fox does the Sarandon for the Hart Trophy before Mark Messier comes out for the presentation. Sidney wins, kisses his date, and crumples to the floor in a heap before looking for a roughing call from Eric Stonestreet. No, actually he makes a boring speech and thanks his teammates.